Handfasting – although it is associated with the ancient Celts, the tying of the couple’s hands together with a cloth to symbolize the joining of their lives, is an important part of the Orthodox wedding ceremony as well. Due to its association with the Pagan Celts, some houses of worship will not allow it. Unity Candle – the couple’s mothers typically each light a taper candle and then the couple lights one central candle to symbolize two families become one. It is not a religious ceremony so check if your house of worship will allow it. Sand Ceremony – same principle as the unity candle ceremony, but using sand rather than candles. Best suited for an outdoor ceremony. 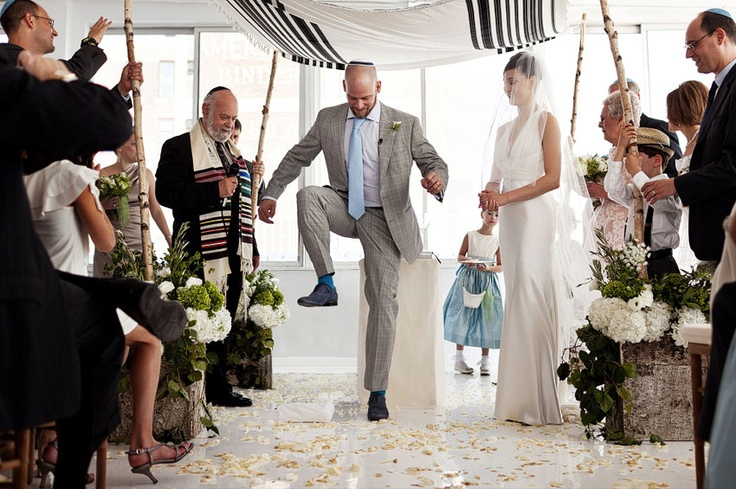 Jumping the Broom – an African-American tradition, the couple jumps over a broom laid on the ground at the end of the ceremony, symbolizing sweeping out the old and starting a new life together. Tradition in the South held that whoever jumped highest over the broom would be the head of the household. Flower Exchange – the bride gives a flower from her bouquet to her mother when she walks up the aisle and one to her new mother-in-law as she exits. Breaking the Glass – traditionally done at the end of a Jewish wedding ceremony, the groom steps on a glass, symbolizing many things, including that just as the glass can never be put back together, so too are the couple’s lives forever changed in marriage or that glass is fragile and needs to be handled carefully and cared for, just like a marriage. Easiest to do using a lightbulb wrapped in a handkerchief and be sure the groom is wearing shoes. Water Blessing – this is a ritual my husband and I created for our own beach ceremony. We each poured sea water into a bowl and then my sister had everyone in attendance place their hand in the water while making a blessing or an intention for our marriage. Our wedding rings were then placed in the water to receive the blessings. After we exchanged rings, the two of us poured the water back into the ocean so the blessings would be carried to the rest of the world. Seems to have worked as our 14 years together have been truly blessed! Remember, it’s your wedding and include only what feels meaningful to you both.